BrowsingHistoryView is a utility that reads the history data of 4 different Web browsers (Internet Explorer, Mozilla Firefox, Google Chrome, and Safari) and displays the browsing history of all these Web browsers in one table. The browsing history table includes the following information: Visited URL, Title, Visit Time, Visit Count, Web browser and User Profile. 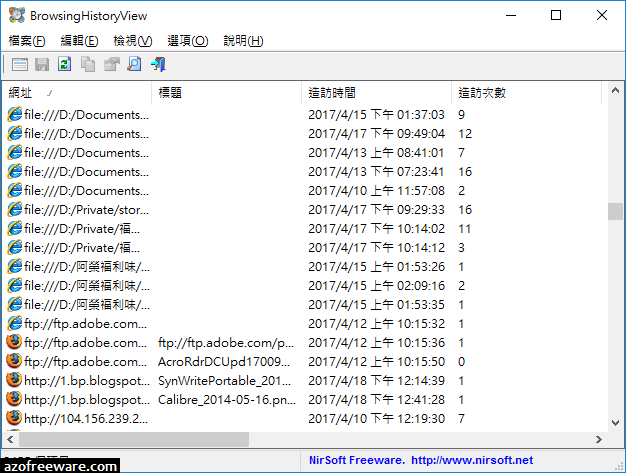 BrowsingHistoryView allows you to watch the browsing history of all user profiles in a running system, as well as to get the browsing history from external hard drive.